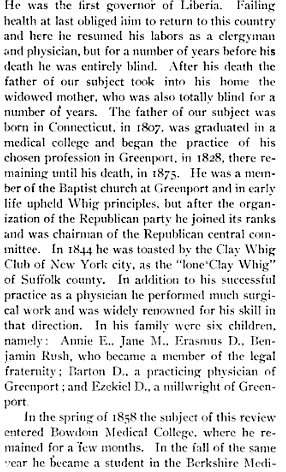 Note of February 2014: Many thanks to the reader who supplied the middle name of her ancestor, Dr. Erasmus Darwin Skinner. Photograph, possibly taken in the 19th century, of a house identified on the reverse as the home of Grandpa Hallock at Cutchogue, New York. 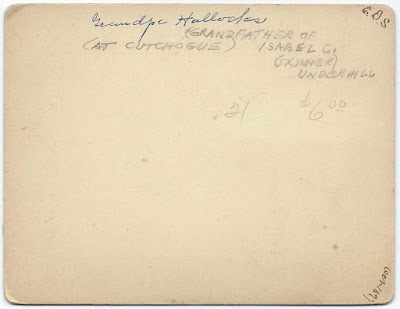 Thankfully, his granddaughter's name is also given, Isabel C. (Skinner) Underhill, so it was possible to determine that Grandpa was Alanson Hallock of Cutchogue. 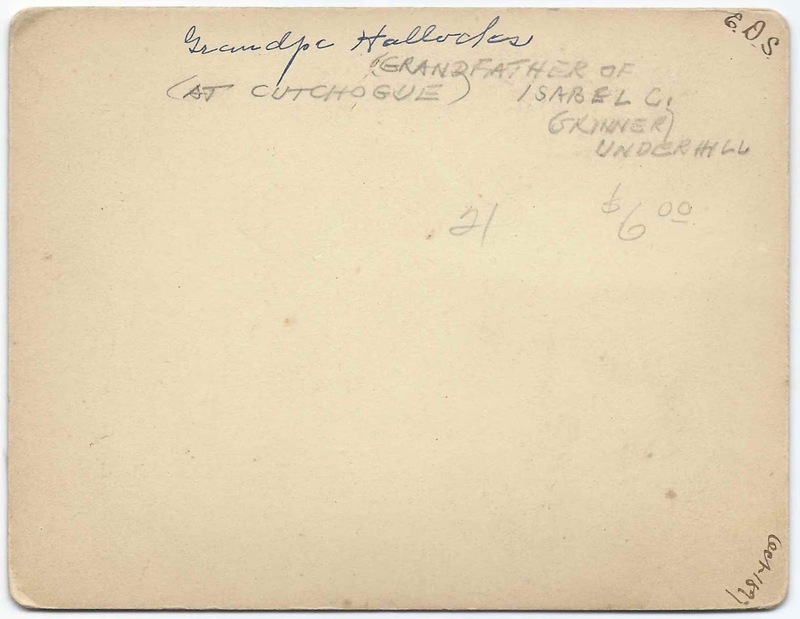 In records and references online, Isabel was also called Isabelle, Isabella and Belle. The photograph with its small margin measures approximately 5-1/2" x 4-1/4". 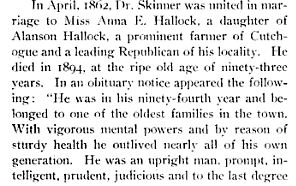 Isabelle C. Skinner was born about April 1870, I think at Mineola, New York, the daughter of Dr. Erasmus Darwin Skinner and Mary E. (Hallock) Skinner. 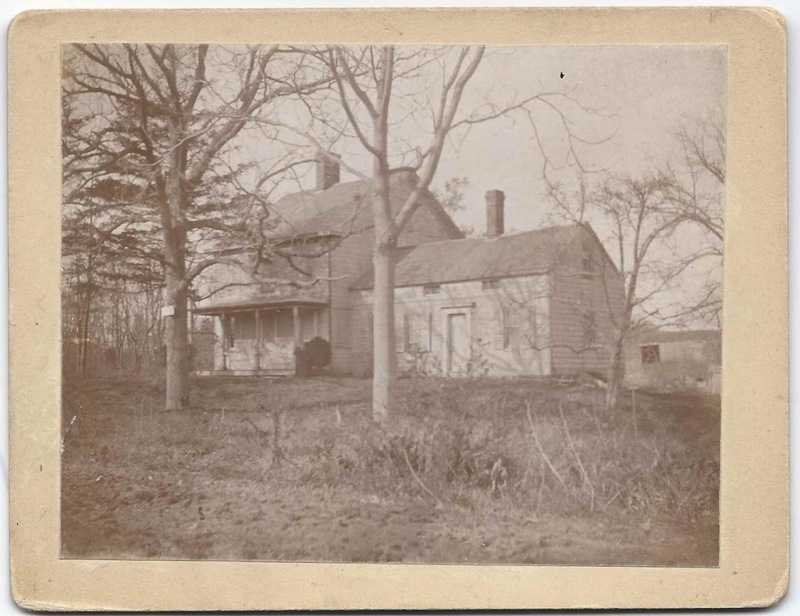 Mary E. (Hallock) Skinner was the daughter of Alanson Hallock of Cutchogue, New York, and it's presumably his home that appears in the photograph above. 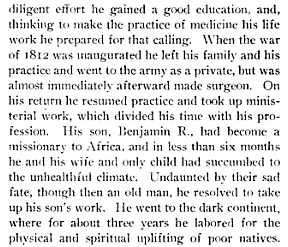 Alanson Hallock was born 2 October 1801 at Cutchogue, New York, son of Luther and Eunice (Case) Hallock. He married Parmelia Reeves, daughter of Jonathan and Mehitable (King) Reeves. 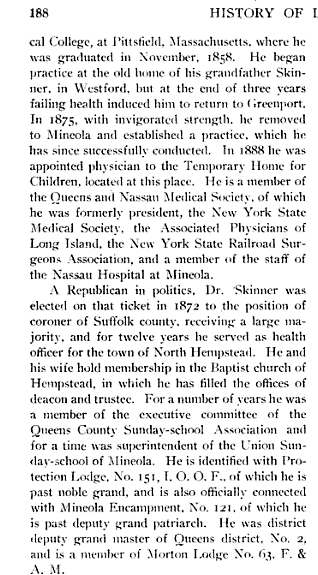 An article about Dr. Erasmus Darwin Skinner in the History of Long Island, From Its Earliest Settlement to the Present Time, Volume III, by William S. Pelletreau, A.M., published in 1903, contains information not only on Dr. Skinner but also Alanson Hallock. 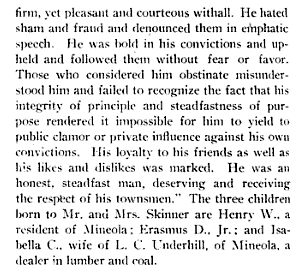 As implied in the article above, Isabelle [Isabel, Isabella, Belle] C. Skinner married Lot Cornelius Underhill, son of Jarvis Frost Underhill and Amanda (Cornelius) Underhill. Lot was born 3 October 1865 at Matinecock, New York. They married at Mineola, New York, on 1 January 1886. If you have corrections to the information above, or additional information on the Hallock family or homestead, please leave a comment or contact me directly. Thanks! Unfortunately I live in FL...and so I do not get back to that area...last time was in 1997...went to Greenport where Dr. Ezekiel Erasmus Darwin Skinner lived. Thanks so much for your comment with the clarification; I've amended the post accordingly. It's possible I got the middle name from the LongIslandSurnames site - you may want to contact them for the benefit of others who happen upon the site. Hope you got a kick out of the photograph!